Neither the iPad nor the iPhone lack for good video-playing options. Between Apple’s own Videos, the built-in YouTube app, and third-party offerings Netflix, Hulu, and Air Video—all of which I use regularly—it’s hard to imagine wanting, or needing, another. AVPlayer HD and AVPlayer, separate apps for the iPad and iPhone, do fill what may be an important niche for some users. That is, the apps from ePlayWorks enable you to play videos that reside on your iPad or iPhone, encoded in just about every major format. And they perform that task well. But transferring videos to the AVPlayer library is awkward—you can do so with a USB connection, or wirelessly through your computer’s web browser or an FTP program, after you open the app, obtain a specific address you enter into your browser, and then upload the videos to the browser. The iPad or iPhone app then immediately imports the videos. Video Maniac: AVPlayer plays many different video formats very well—an FLV file, in this case. You can view technical information about your video, as shown here, and speed up or slow down the playing speed with the plus/minus control, on the right. Air Video, as well as other file transfer apps, in contrast, provide a free utility that you install on your computer, and after an initial, single setup process, allow for simple wireless transfer. 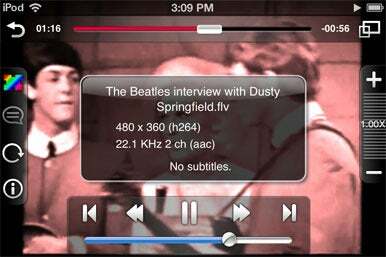 Air Video, a universal iOS app, can play videos in many formats as well, translating them on the fly as they stream via Wi-Fi or even from a remote Web connection. Unlike AVPlayer, however, Air Video does not play videos that are already stored on your device. Considering the ease with which videos can be converted to the iOS-friendly MP4 format with both Mac and Windows utility programs, it’s difficult to imagine that AVPlayer will provide any advantages for most users. That said, both the iPad and iPhone versions of the app performed impressively: Videos of varying lengths and formats all played smoothly and clearly on both my iPad and iPod touch. And one extra feature—the ability to speed up videos to play up to twice their normal speed or down to half-speed—is also a nice touch.